By immersing you in French language and culture, the MOTIFS program will have you communicating in French with confidence! From the very first chapter, you will learn the structures, vocabulary, communication strategies, and cultural background that allow you to interact with your peers in the classroom and with French-speaking people in a wider context. 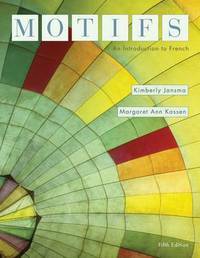 To ensure your success, MOTIFS is supported by helpful learning tools that allow you to experience French as it is spoken today. Kimberly Jansma directs the French Language Program at The University of California at Los Angeles, where she supervises teaching instructors and teaches language, culture, and linguistics courses. She has published pedagogical texts and multimedia materials and presents her research at major conferences. Dr. Jansma's areas of interest include hybrid language instruction, second language acquisition, and sociolinguistics. She received her Ph.D. in Applied Linguistics from the University of Texas at Austin. Margaret Ann Kassen is associate professor and language program coordinator in the Department of Modern Languages at the Catholic University of America in Washington, D.C., where she teaches undergraduate French and applied linguistics courses, as well as works with graduate and undergraduate teacher preparation. Her research interests include foreign language writing, performance assessment, technology-enhanced language learning, and TA development. In addition to presenting at conferences, Dr. Kassen has published articles on technology and writing and edited a volume on developing self-direction in foreign language learners. She received her Ph.D. from the University of Texas at Austin.